As a measurement tool httperf has been chosen coz, even if not perfect, it offers a quite sufficent number of loading options. The files fs/pipe.c and include/linux/pipe_fs_i.h has been also modified to extend /dev/epoll to pipes ( pipe() ). The /dev/epoll implementation resides in two new files driver/char/eventpoll.c and the include/linux/eventpoll.h include file. The interface of the new /dev/epoll is quite different from the previous one coz it works only by mmapping the device file descriptor while the copy-data-to-user-space has been discarded for efficiency reasons. By avoiding unnecessary copies of data through a common set of shared pages the new /dev/epoll achieves more efficency due 1) less CPU cycles needed to copy the data 2) a lower memory footprint with all the advantages on modern cached memory architectures. The test show that the /dev/epoll is about 10-12% faster than the RT signals one-sig implementation and that either /dev/epoll and both RT signals implementation keeps flat over dead connections load. The RT-one-sig implementation is slight faster than the simple RT signal, but here only a couple of SIGIO occurred during the test. 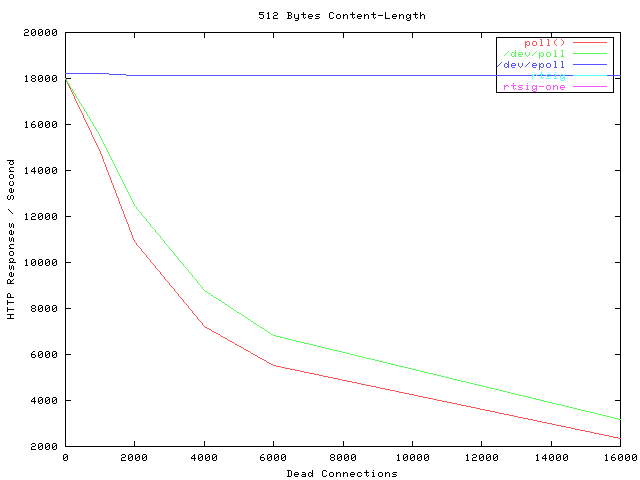 Both the 512 and 1024 Content-Length test show that /dev/epoll, RT signals and RT one-sig behave almost is the same way ( the graph overlap ). 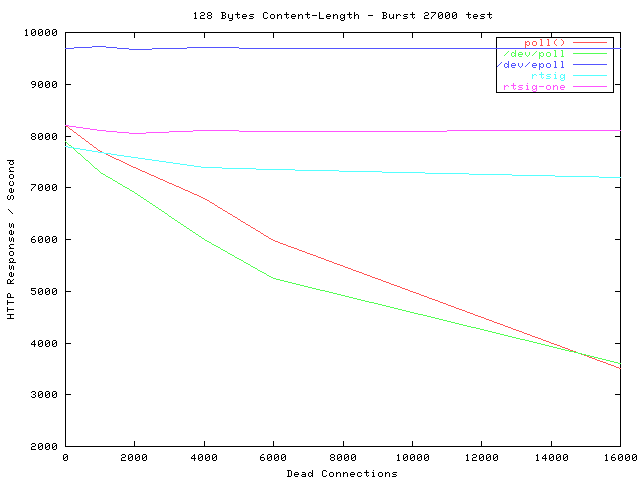 This is due the ethernet saturation ( 100Mbps ) occurred during these tests. This test shows that /dev/epoll, RT signals and RT one-sig implementation had a quite flat behaviour over dead connections load with /dev/epoll about 15% faster than RT one-sig and RT one-sig about 10-15% faster than the simple RT signals. These numbers show that the new /dev/epoll ( and sys_epoll ) improve the efficency of the server from a response rate point of view and from a CPU utilization point of view ( better value of CPU/load factor ). The response rate of the new /dev/epoll in completely independent from the number of connections while the standard poll() and the old /dev/poll seems to suffer the load. The standard deviation is also very low compared to poll() and old /dev/poll and this let me think that 1) there's more power to be extracted 2) the method has a predictable response over high loads. Both the RT signals and RT one-sig implementations behave pretty flat over dead connections load with the one-sig version that is about 10-12% faster than the simple RT signals version. RT singnals implementations ( even if the one-sig less ) seems to suffer the burst test that simulates the real internet load where a huge number of connections are alive. This because of the limit of the RT signals queue that, even with the one-sig patch applied, is going to become full during the test. The epoll scalability page at lse. W. Richard Stevens - "UNIX Network Programming, Volume I: Networking APIs: Sockets and XTI, 2nd edition"
 W. Richard Stevens - "TCP/IP Illustrated, Volume 1: The Protocols"
Addison Wesley professional computing series, 1994. G. Banga and J. C. Mogul - "Scalable Kernel Performance for Internet Servers Under Realistic Load"
Proceedings of the USENIX Annual Technical Conference, June 1998. G. Banga. P. Druschel. J. C. Mogul - "Better Operating System Features for Faster Network Servers"
SIGMETRICS Workshop on Internet Server Performance, June 1998. G. Banga and P. Druschel - "Measuring the Capacity of a Web Server"
Proceedings of the USENIX Symposium on Internet Technologies and Systems, December 1997. Niels Provos and Charles Lever - "Scalable Network I/O in Linux"
 Dan Kegel - "The C10K problem"
 Richard Gooch - "IO Event Handling Under Linux"
 Abhishek Chandra and David Mosberger - "Scalability of Linux Event-Dispatch Mechanisms"
 Niels Provos and Charles Lever - "Analyzing the Overload Behaviour of a Simple Web Server"
 D. Mosberger and T. Jin - "httperf -- A Tool for Measuring Web Server Performance"